Dr. Carly knows that pregnancy can be one of the most joyful stages of a woman’s life! In just nine months two cells miraculously develop into a perfect human being. It is the most brilliant task our bodies are made to perform. Chiropractic care before and during pregnancy can help create optimal pelvic alignment to create the most efficient environment for your baby to develop. Chiropractic care during pregnancy has been shown to help reduce labor time, reduce the need for interventions (such as epidural, induction and cesareans), and ease labor. Overall, you can experience a more comfortable pregnancy, labor and delivery with routine chiropractic care. Dr. Carly can help keep your body in proper alignment so that your nervous system can communicate to your uterus and more effectively aid with the growth and development of your baby. 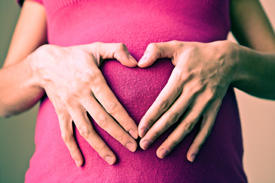 There have been no documented risks associated with chiropractic care during pregnancy. Dr. Carly uses the Webster Technique to help obtain pelvic symmetry. A properly aligned pelvis will help reduce tension in pelvic ligaments that are connected to the uterus. This will allow proper symmetry of the uterus as well, providing the baby an optimal environment for growth, development and positioning. A properly aligned pelvis can help labor go as smoothly as possible on the big day! Dr. Carly uses the Bio-Geometric Integration (BGI) technique that allows her to provide gentle adjustments using less force for your body. The frequency of your visits is dependent on your individual needs. Pregnancy can cause changes in the spine and pelvis and Dr. Carly can help guide your body back to proper alignment. Contact us today and see how pregnancy chiropractic care can allow your baby to have a smooth transition from womb to world.